Paul and I rented a townhouse with a mooring in Port Grimaud, the marina across the bay from St Tropez. We hired a motorboat, and spent a lovely 2 weeks zipping around the bay, anchoring off Pampelonne Beach, and swimming in the gorgeous warm water. Dressy clothes and jewellery – this is St Tropez after all! Flat shoes – it’s very hilly! Highlights: We had dinner at a gorgeous chateau one evening, which has an amazing view down to the sea, across the hills around St Tropez, and watched an impressive electrical storm – it’s still a really green, wild, unspoiled area, nothing like the busier side of the South of France, over towards Cannes and Nice. We were also there on Bastille Day, so had a great view of the fireworks in St Maxime on one side of the bay, and St Tropez on the other. Top tips: Stay in Port Grimaud – then you can take an inexpensive ferry across to St Tropez for dinner in the evenings, rather than worrying about driving and parking; or paying an arm and a leg for a taxi. Plan to do some shopping – although there are plenty of madly expensive Gucci, Bulgari, Dior and Dolce & Gabbana boutiques, there are also a lot of surprisingly inexpensive and very lovely independent stores, with great clothes, jewellery, homewares and foodie treats. Head away from the harbour area in St Tropez for dinner – leave that for the tourists! In the winding alleyways are plenty of busy, excellent and perfectly affordable eateries and bars which are buzzing with all nationalities. Favourite outfit: To be honest, I spent most of the 2 weeks in a bikini on the boat! But in the evenings, a couple of dresses from Phase 8 and Reiss, and a pair of white jeans, stood me in good stead. What was in your fabulous jewellery roll? My Nikki Lissoni sets – I have three – are perfect for holiday. Versatile, easy to wear, and fun to mix and match. My ChloBo gold stack – bracelets in Red Tiger’s Eye and Yellow Gold – rarely left my wrist every evening; teamed with my Thomas Sabo gold stud earrings. And my white CK watch is perfect for the sunny South of France. 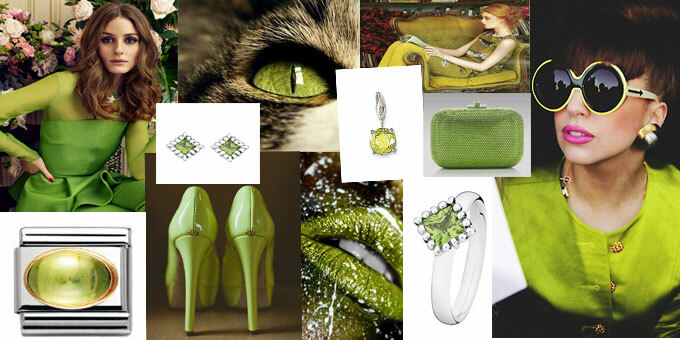 Peridot is one of the few gemstones which exist only in one colour and its lively shade of green is perfect for every season. Fine traces of iron account for the deep green colour which has a slight golden hue. The name Peridot is derived from the Greek word “peridona”, meaning “to give plenty”. It is traditionally the symbol of fame, love and loyalty and is said to enhance prosperity, growth and openness. The oldest source of the Peridot was the Egyptian island of Zeberget and at one time Peridot was more valuable than Diamonds. The Pharaohs insisted that there were to be no visitors to this island in order to protect the mining of this cherished gemstone, and many historians believe that the famous Emeralds worn by Cleopatra were in fact Peridots! Peridot was later used to decorate medieval churches, for example, three rare 200 carat Peridots adorn the Shrine of the Three Kings at the famous Cologne Cathedral in Germany. Check out our fabulous collection of August birthstone jewellery for the ideal birthday gift this month, or treat yourself to jewellery from designers such as Pandora, Nomination and Thomas Sabo for a fabulous way to add peridot green to your style. We’re very excited about the arrival of the Royal Baby here at fab HQ – so we’ve put together our selection of what we’ll be adding to our jewellery collection to celebrate this momentous occasion. You can buy Royal Baby charms at fabulous, or create your own set to remind you of this wonderful occasion. If you’re a Thomas Sabo collector then you’ll be delighted to know that they’ve released a special edition charm, The Royal Baby charm features an Enamel Union Jack, baby boot and crown! It’s so cute and as with all Thomas Sabo is made from 925 Sterling Silver with a lobster clasp to fit any Thomas Sabo charm bracelet. Our fabulous team have put together a selection of Nikki Lissoni sets, all individually designed by a fabulous team member, each set has a particular meaning and is a great way to get your Nikki Lissoni collection under way. We love Laura’s design from the fabulous Bath team – The Royal Baby set. In Rose Gold, featuring a 60cm graduated chain, Rose Gold carrier and Rose Gold crown coin. If you’re a Pandora collector then you’ll be thrilled with their Baby Carriage charm. The Pandora charm is a Sterling Silver pram featuring a Gold crown, the pram is inscribed with Royal Baby 2013, the perfect memento for this special occasion! Do you know someone who has had a baby on the same day? These would make a great gift for the Mother, or a wonderful keepsake for a baby girl or, if you’re a big Royal fan, treat yourself to a fabulous memento of the day. Congratulations to Will and Kate on the arrival of their beautiful baby from all at fab HQ. My sister and I went to Dubai for a week to visit our friend; we had the most amazing holiday ever! It was lovely to lie around by the pool on the top of her apartment block and listen to the busy daily life of Dubai. We went to the biggest shopping mall ever, with an inside aquarium! Highlights: Whilst having a meal, we were sat outside by a massive lake, and all of a sudden the fountains started and were in sync with lights and music! It was incredible to see, everyone just stopped and watched! Top tips: My top tip for Dubai is take an extra suitcase, as the shops are out of this world! Lots and lots to purchase!! Favourite outfit: My favourite outfit must be my flowery maxi dress from New Look! It’s so comfy to wear and very light, which is very helpful in Dubai with it being so hot day and night! What was in your fabulous jewellery roll? I lived in my Lola Rose White bracelet; it went with everything and especially stood out with my tan! Holiday essentials: Sandals, a good book (or two) and insect repellent. Highlights: It may sound silly but my highlight was just being away. You can get so caught up at home that it was nice to have a week of sun and relaxation. Our hotel had a private beach and waking up to that view every morning was absolute bliss, it’s safe to say I did not want to come home! We did go on several excursions while we were there; one was an African Night, where we spent the afternoon at a Sarafi Park and later we were treated to a traditional Tunisian meal along with traditional African dancing. We also visited Carthage; the ruins are absolutely breathtaking, and there are lots of buildings of interest on the way to take in. Top tips: Tunisia has a closed currency so you can’t change your money until you’re out there. You should be able to do this at your hotel so don’t feel you need to change it all, you can change it if/when you need some more. Having a closed currency does mean that you can’t leave with any either. If you have any notes you can change these at the airport … they won’t let you through security if you still have any Dinars on you! We went in May and although it was lovely and hot during the day it did get a bit nippy at night, so make sure you bring a light cardigan to cover up. Favourite outfit: Anything maxi! I brought several dresses and skirts with me. They are so easy to wear and go great with a part of sandals for a casual evening look. What was in your fabulous jewellery roll? I tried to keep my jewellery options quite simple whilst away so only took a few pieces. I opted for my Rose Gold jewellery as I thought this would go well with a tan (wishful thinking on my part that I would actually tan!) I took my Pure Attraction Rose Gold frosted earrings, BCBG multi-dial watch, Tresor Paris bracelet and my Calvin Klein tri-coloured ring. Nikki Lissoni Sets: Designed by fabulous! We know how hard it is to decide on a Nikki Lissoni set, there are so many beautiful combinations and exciting choices to make. Which Nikki Lissoni chain to start with, graduated or belcher, Gold, Rose Gold or Silver – what length? We absolutely love making Nikki Lissoni combinations, especially as we get to ogle the collection all day at work (it’s a hard life!). So, Becky our training manager came up with a fun competition this month for the whole fabulous team. Each team member came up with the Nikki Lissoni set they’d love to own, or already do! If you head to the website you’ll see all of the fabulous combinations the team have come up with along with a fabulous description explaining the meaning behind their set. There is a little friendly competition between the staff members on whose Nikki Lissoni set will be the most popular – so you can head to our Facebook page and ‘like’ your favourite set. The designer with the most votes wins a fabulous prize! These Nikki Lissoni sets are all available to buy online at fabulous with Free UK Delivery and start from £95 for a full set including Nikki Lissoni chain, Nikki Lissoni carrier and Nikki Lissoni coin. The previous collection of ‘national icons’ proved to be extremely popular, with demand for these items still being high. This new collection promises to be popular with the addition of the Sydney opera house £40 (which has already been reserved by lots of our Pandora lovers) and Moscow’s St Basil Cathedral, £35. The new hot air balloon charm (£30) will definitely be a big hit, with lots of interest in this charm before it has even been released. If you’re buying a hot air balloon ride for a special gift, this would be a great way to break the surprise! The blue and white enamel detailing on the hot air balloon along with the dangle basket makes it a very special charm. We love the passport charm priced at £30, which will no doubt be very popular. We get a lot of customers asking how they can show ‘travel’ on their bracelet and this would be the perfect way. The Vespa scooter priced at £35 is a quirky and fun addition to the collection; the red Enamel and Cubic Zirconia make this charm bold and very fun for the summer. We love the Italian gondola charm priced at £40. Venice is a very popular destination for city breaks so If you know someone who got engaged there or is spending a memorable birthday at the beautiful city, this would be a fabulous gift. If you’d like to order any of these fabulous new charms from Pandora – give us a call on 0845 450 9334 and we can deliver them straight to your door for FREE, or email us on enquiries@fabulouscollections.co.ukwith your name and number and we’ll call you back!